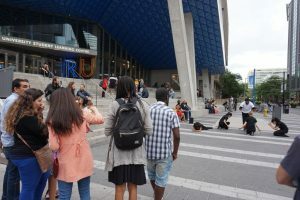 Every time of ministry, DRIME Toronto has great conversations with people they meet on the street. Here are some recent conversations, which show how God is working in people’s hearts in Canada’s biggest city. Yasmine, a volunteer from a local church, spotted this beautiful 19 year-old girl because she really liked her haircut. Kara had been in Canada for only two weeks, has no friends and is living downtown in a student building. She was very open to chat and shared that she grew up in a Presbyterian Church. After a long chat, we invited her to our church. Hebecah (DRIME Toronto member) met with her at the subway station the next day so they could go together to church. She was very encouraged to have experienced our church service and to have met so many lovely people from our church fam. She left saying she was very uplifted to have met normal people, as she had been exposed to a world that wasn’t familiar to her in the community of students who live downtown. She came back the next Sunday for another church service. It’s so amazing to witness the love of the Father towards her. Our prayer is that she will receive the revelation of the Holy Spirit and Jesus and that she will be protected as she goes to school and hangs out with people who don’t know Jesus. We want her to be a light and not conform to this world. Divante (DRIME Toronto leader) spoke to Jasmine, a young lady from Saudi Arabia. She said that she was a Muslim, converted to Christianity but converted back to Islam. He was so intrigued by her story so he asked her to explain what happened. She was open to explaining and after hearing her story, Divante could sense her heart and desire for Jesus. She said that she was able to understand this. It was so beautiful the way she just understood, praise God! I continued to talk to her and encourage her about not being afraid and that God would be with her in her conflicts with her family. I gave her two tracts, one explaining who Jesus was and another that was a testimony of a woman converting from Islam to Christianity. She read the second tract right away while she continued to watch the dramas. Divante approached her again and she said the story was so similar to hers. He continued to encourage her and prayed for her. Last, he asked if she would have us all pray for her and she agreed. Please keep Jasmine in your prayers, I believe she believes but is fighting against the enemy trying to steal the word away from her heart. 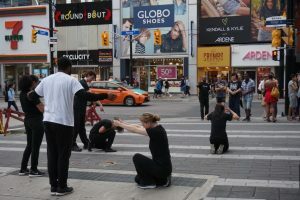 These are just two of many conversations that have happened on the streets in Toronto! DRIME Toronto will be starting up their new ministry season in just a few weeks. You can follow DRIME Toronto on Facebook to see more stories of how God is working in this city.